After my friends ran the 21km Uphill Challenge from General Trias to Tagaytay City we thought it would be a great option to stop somewhere and have breakfast as a treat after finishing a half marathon. So the hunt for a good breakfast place in Tagaytay began. Then, we found Bag of Beans. The place is normally very busy but parking was not too difficult to find. Luckily, that morning was not that busy yet and we found ample parking spaces located to the side of the restaurant. Bag of Beans is very easy to find. For you to find it easier, I have attached a map. Don’t leave without buying their roasted coffee beans. Aside from coffees, they also have breads for sale. Going down to their restaurant, it was like walking down the stairs into a different world away from the busy streets of Tagaytay and bustling noise of Manila. Being inside felt very calm and the feeling of nature giving you a hug. They also have different functions rooms available. With the different colored lamps hanging from that tree, I wondered how it looks in the evenings. Bag of Beans is very famous with their coffees and we could not wait to try their Barako Coffee. Checking on their menu, there were so many to choose from. I was craving for a nice pancake so I ordered a Blueberry Pancake and my friends ordered a Banana Walnut Pancake. For a coffee addict like me and for someone who woke up at 3am because of the run, bottomless was a great choice. And for that price, I couldn’t ask for more! You can also check the other choices on their menu. While waiting for our breakfast, I walked around Bag of Beans. I really liked the whole atmosphere of the place. You have huge trees covering and giving cool shade so eating outside there was a pleasant breeze in spite of the dappled sun in the courtyard. Dining areas were all different and it all felt very homey. This is perfect for big group dinners. Soon after, our delicious looking pancakes arrived. Bag of Beans also offers buffet breakfast and brunch. I didn’t walk along the food area but this shows you how famous their buffet breakfast is. This place is not massive compared to any other restaurants in Tagaytay and maybe that’s also one reason why I liked this place a lot. You don’t have that feeling that food is always served or prepared to cater for big crowds..
around Bag of Beans and sometimes causing additional traffic issues in the always crowded Tagaytay. Were we happy with our breakfast? Super! 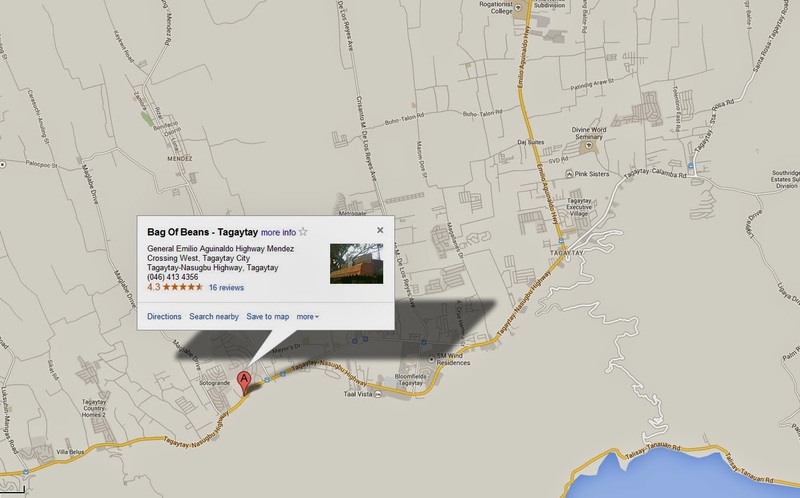 So when you visit Tagaytay City again, check out Bag of Beans! They are open from Monday – Sunday from 6:30am until 10:00 pm. I am just not sure how your comment is related to my article. Very nice place for drinking a cup of coffee. I really wanted to come here to drink a roast coffee. Can you give me details review of your restaurant.